As we enter April, surely everyone with an internet connection is well aware that it is Autism Awareness Month. Indeed, you cannot surf very far without reading about this organization or that holding a walk, run, bake sale, or shirt sale in effort to increase the general public’s awareness of autism. I mean, it has to be on behalf of the general public, right? Because adult autistic self-advocates are already very aware. Parents are keenly aware of their children’s autism. Many autistic children are aware of their autism. Our community doesn’t need the awareness message. And so, with that, I propose that any Autism Awareness message this month be based on real issues within our community. The autism community must make the Rainman focused, Temple Grandin quoting general public aware of what is really going on here. 1:68 means nothing – unless you have 1 or 2 of those 68. Lighting your porch blue does nothing if you don’t follow that up with action or education. Today, April 1st, is being set aside as A Day of Remembrance. Today, members of the autism community representing parents, self-advocates, family and friends of autistics are taking time out to remember the children and adult autistics who have lost their lives due to wandering, or elopement. Today, wespread education rather than pseudo-awareness. 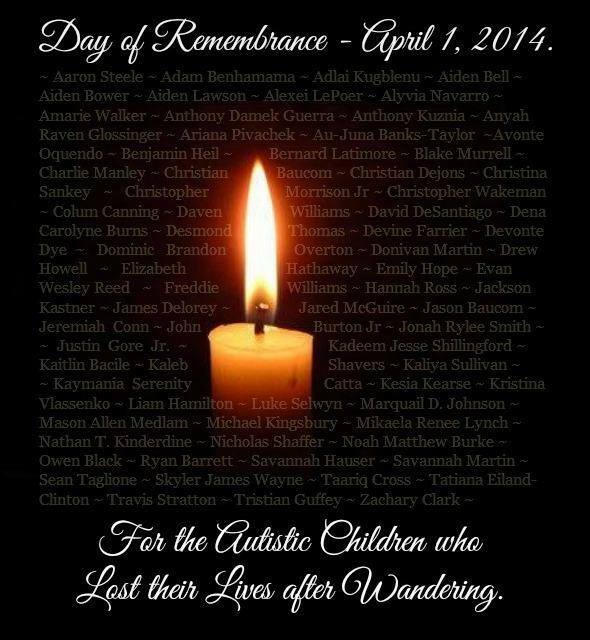 Since 2011, nearly 100 autistics have died as a result of elopement. I’ll say that again. In the relatively short period of time between 2011 and now, nearly 100 persons with autism have died as a result of wandering away from home or school. It’s time, folks. It’s time to come together and form one cohesive voice. We must find a way to keep our family safe. Increased breakthroughs in safety, education, and therapies are going to be necessary to combat wandering. Increasing “awareness” of autism will not keep our children safe, but maybe increasing understanding of the challenges within our community will. Blogger extraordinaire, Jill Smo, of “Yeah. Good Times.” has started a movement to unite our voices. On this one day, regardless of whether you are anti-vaxx or pro-vaxx, biomed or not, an adult self-advocate or parent, we are uniting to remember the lost loved ones in our community. Take a moment. Say a prayer. Light a candle. Send out positive energy. Whatever you feel comfortable doing, please do. And share. Share this photo. Use it as your profile pic on Facebook, Tweet it or Pin it. But add your voice. And let’s make some noise for those who can no longer be heard. This entry was posted on April 1, 2014 by militaryspecialneedsnetwork in All, autism awareness, Family, Mental Health, military special needs network, MSNN, Parenting, Special Needs Parenting Challenges and tagged 4/1/14, april 1, april 1st, autism awareness, autism education, autistic children who lost their lives after wandering, bolting, day of remembrance, elopement, jill smo, Light it up blue, Military Special Needs Network, MSNN, MSNNblog, wandering, yeah good times.